Safe Bathing Canada now enables homeowners in Milton to truly relax with the help of walk in tubs. A warm, relaxing bath should not be a chore that poses slip and fall hazards. Let us replace your existing bathtub or shower with a walk in tub to provide a safe, more comfortable environment in your home. a pneumatic push button to speed drain your walk in tub in as little as 90 seconds. in-line heaters to keep the water at the right temperature for as long as you need it in order to afford you a lovely soak. powerful, high-quality pumps that operate as quietly as a whisper. designer faucet sets that include spigots for fast tub filling and lever handles for ease of operation, especially for people who suffer from arthritis. air jet therapy and hydrotherapy to relieve stress and pain, improve muscle and skin elasticity, reduce depression and anxiety, promote relaxation and induce more restful sleep. 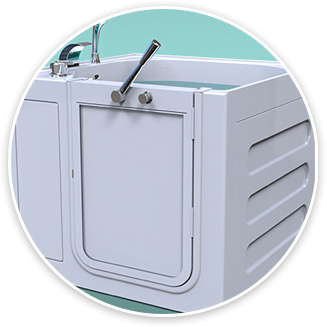 Safe Bathing Canada's specialist bathroom consultants and walk in tub installation experts are manufacturer trained to provide Milton home owners with the best advice and quotes on walk in tubs. Whether you live in Barrie, Cornwall, Kitchener, Niagara Falls, or Milton Safe Bathing Canada consultants will advise you on the best options for your specific needs. We have serviced a multitude of residences and assisted living facilities across Canada and we can assist you too. Contact Safe Bathing Canada today to find out how you can own a walk in tub in your Milton home from only $5 a day.